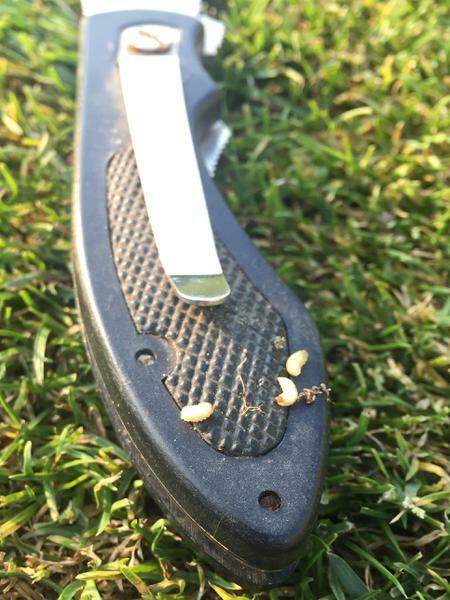 Initially identified as the Hyperodes weevil, the annual bluegrass weevil, Listronotus maculicollis, has historically been a destructive pest of annual bluegrass and creeping bentgrass on fairways and greens in the northeastern United States. It was first described as a turfgrass pest in Connecticut in 1931. Since then, it has spread south and west and has become an insect of concern for managers in western North Carolina (Figure 1). Figure 1. Approximate annual bluegrass weevil distribution in North Carolina. 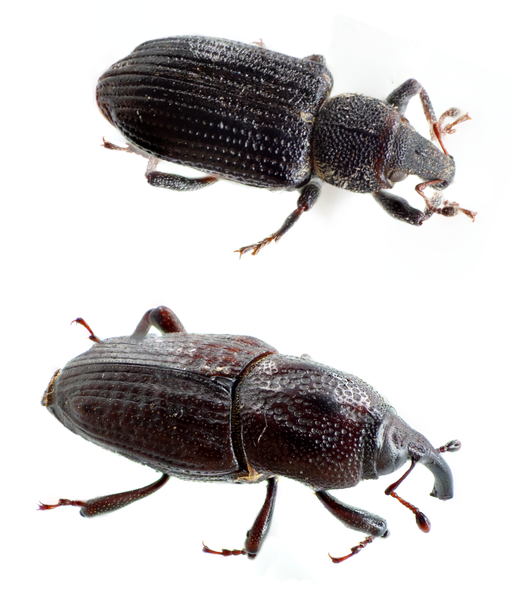 Annual bluegrass weevil adults (Figure 2) are dark brown or black beetles, approximately 1⁄8-in long with a pronounced, curved snout and have gray-yellow hairs and scales on the thorax and elytra (hind wings). ABWs resemble billbugs (Figure 3), another common turfgrass pest, but are much smaller (~1⁄3 size), their antennae attach to the tip of their proboscis (snout), rather than the base and their snout is shorter and stouter than that of a billbug (Figure 4). Larvae are cream-colored with red-brown head capsules, legless, and range from 1⁄25 to 1⁄6 inches long (Figure 5). ABW eggs are yellow initially but turn gray as they mature. Figure 2. Annual bluegrass weevil adults. Figure 5. Annual bluegrass weevil larvae. In North Carolina, annual bluegrass weevils are primarily a pest of Poa annua and creeping bentgrass but can also feed on perennial ryegrass. 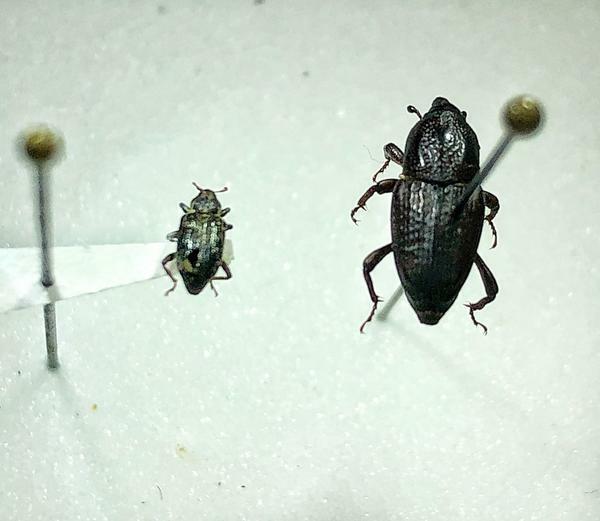 Research from New York and Massachusetts indicates annual bluegrass weevil adults overwinter in treelines and other semi-protected areas on golf courses, although this has not yet been confirmed in North Carolina. Adults become active in late March to early April and females begin laying 2-3 eggs in leaf sheaths, typically in short-mown turf. Larvae emerge in mid-early April, depending on location, and develop through five instars that typically last 5-7 days each before pupating. Pupae develop for another 5-7 days before adults emerge, with the first peaks in adult activity usually occurring in early-mid May. In southwestern North Carolina, ABWs will have three generations per year, whereas in northwest North Carolina, there may only be two. Although there are some similarities in terms of ABW behavior in the northeast and the southeast, we have observed considerable differences in terms of life stage appearance timings. Adults in North Carolina appear and are active much earlier than in the northeast. Once overwintered adults have emerged, ABWs quickly cycle through three generations and most ABW activity has ceased by October. As a result, the ABW season in North Carolina is more condensed and occurs earlier in the year. This can have a tremendous impact on insecticide selection and application timing for management of this pest. 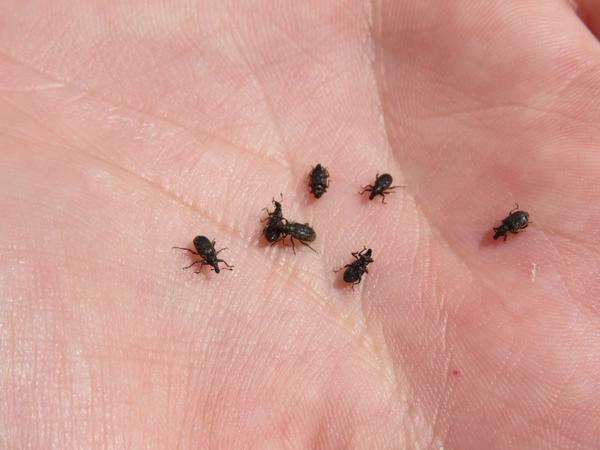 As temperatures increase in late spring, adult annual bluegrass weevils move from their overwintering sites, feed, mate, and lay eggs in the turfgrass. Adults cause damage to the turfgrass plant by chewing tiny notches in blades and although past research has stated that this does not appear to have a detrimental effect on the overall health of the turf stand, we have observed an increase in turf damage with increases in adult activity. Larval feeding consists of tiny larvae feeding within the grass stem. As they grow, they move down around the outside of the plant and into the crown. Larval damage causes small, yellow spots on short-mown turf. Early damage typically occurs in mid-May. More significant damage is observed when there is an overlap between the previous generation’s adult population and the next generation’s larval population (early-mid July and early-mid August) (Figure 6). Figure 6. Mid-season vs late-season annual bluegrass weevil damage. Traditional collection approaches for annual bluegrass weevil adults involve running a reverse air flow leaf blower with mesh netting attached to the front of the nozzle across the turf surface. This technique does not appear to work in areas with lower ABW populations so we recommend applying a soapy water flush (1-2 tablespoons per 1 gallon water) to a square section of the turf (2 feet x 2 feet) and wait 3-4 minutes for adults to emerge. To examine a turf stand for larvae, cut a small sample (3 inches x 3 inches x 3 inches) section from the area. Tease the tissue apart and look for all life stages. Submerge the sample in a salt-water solution (3⁄4 cup salt in 1 quart of water) for one hour. Some research (Vittum 1999) has shown that the beneficial nematode Steinernema carpocapsae can reduce annual bluegrass weevil populations by almost 50%. Bt has also been used to reduce larval populations by 50-65% (Vittum 2005). Spinosad can also be very effective (80% control) against larvae but only when used at a high rate. As with all control options, accurate timing is essential to successfully reducing populations. In the northeastern United States, researchers have had success with a number of different products including most pyrethroids (bifenthrin (Talstar) and lambda-cyhalothrin (Scimitar)), indoxacarb (Provaunt), chlorantraniliprole (Acelepryn), and cyantraniliprole (Ference). However, we have observed some of these products to be more effective than others in the southeastern United States. In North Carolina, because it is difficult to find larvae except in areas of intense damage, management of annual bluegrass weevil relies on effective control of the adult life stage. We have observed good control of adults with pyrethroids such as bifenthrin (Talstar) and lambda-cyhalothrin (Scimitar). However, frequent, repeated use of these products over a very short period of time (3-4 years) has led to extreme resistance issues in some areas of North Carolina. Consistent use of pyrethroids without rotating with other insecticide classes not only makes these products ineffective but can also cause cross-resistance with other active ingredients, like chlorantraniliprole (Acelepryn). We have observed little-moderate control with indoxacarb (Provaunt) and chlorantraniliprole (Acelepryn) but found cyantraniliprole (Ference) to be successful at controlling ABW populations. Chlorantraniliprole (Acelepryn) has provided good control of larval populations in studies in other parts of United States but we did not find it to be very effective against 1st generation larvae in North Carolina. Research conducted in New Jersey found cyantraniliprole (Ference) to have 80-90% control of larvae, irrespective of pyrethroid resistance level so it can be used in a rotational insecticide resistance program. Although the majority of research indicates cyantraniliprole (Ference) is more effective at controlling ABW larvae, we have also observed some adult suppression in field populations. Remember, it is essential to apply these insecticides at the time when the majority of the adult population are active, so a monitoring program for adults must be implemented to pinpoint application timing. Monitoring for annual bluegrass weevil is an essential part of a successful management program, particularly in North Carolina. Because this insect is not fully established in some areas, when sampling at sites that are relatively close to each other (< 15 miles apart), you may notice a big difference in emergence timing, population size of ABW life stages, and damage intensity. Therefore, proximity to a golf course that may or may not be spraying for ABW should not dictate the application timing for a nearby site. Depending on where you are located, insecticide application timings may need to be adjusted by a week or two in order to maximize product efficacy. Keep a map of areas of past damage, apply a soapy water flush to these areas weekly, and keep track of adult numbers over the growing season. When these numbers start to increase, plan your application approach and select the most effective product for that life stage. Annual bluegrass weevil: a metropolitan nightmare. Vittum, P. J. 1999. Turfgrass Trends 8 (5): 1-6. Biology and Control of the Annual Bluegrass Weevil. Koppenhöfer, A. and B. McGraw. 2016. Evaluation of Insecticides on Hyperodes spp, a pest of annual bluegrass turf (Coleoptera: Curculionidae). Tashiro, H., et al. 1977. Journal of Economic Entomology 70: 729-733. Turfgrass Insects of the United States and Canada, 2nd ed. Vittum, P.J., M.G.Villani, and H. Tashiro. 1999. Cornell University Press, NY. 422pp. Vittum, P. 2005. Annual bluegrass weevil: A metropolitan pest on the move. Golf Course Management. May 2005. p 105-108. 2018 Pest Control for Professional Turfgrass Managers. Bowman, D. et al. 2017. NC State Extension Publication AG-408. 81 pp. This information is based on extensive sampling and insecticide trials in NC in 2015 and 2016. These general guidelines represent our best attempt at creating a management plan for ABW in NC based on the information that we have collected over those two years. 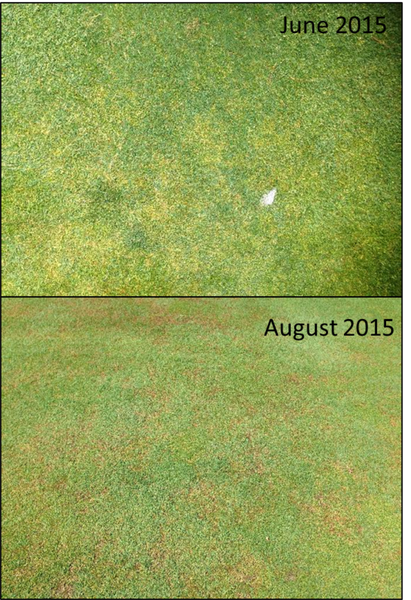 We do not guarantee that this approach will be 100% successful for ABW management but we do believe it will help focus management efforts and will help avoid poorly timed applications of ineffective products that will not yield positive results. We will continue to study this insect and will refine this approach accordingly.